While we live in the cramped city of New York, doesn't mean it has to be all sacrifice. While we all love an outdoor pool which tends to be found on the rooftop, it's not always the best year round. For those of you who enjoy the serenity of an indoor pool, we've got you covered. The newly launched Steiner East Village has welcomed its first residents, as closings have begun at the 82-unit, 7-story, full service luxury condominium developed by Steiner NYC. The project, which includes one- to four-bedroom condos and penthouses, , is now 75% sold and has entered its final phase of sales. The building’s amenity spaces, encompassing over 16,000 square-feet, are best-in-class for the East Village and include a transcendent 50’-indoor pool, lush garden, 2,000-square foot fitness center, sauna, steam room, parking, resident library with fireplace, bike storage, pet spa, children’s playroom, and a 4,000-square-foot common roofdeck with stunning, protected views. Prices on remaining units start at $1.675 M.
Located in Murray Hill, American Copper Buildings is a dual-tower residential skyscraper that recently opened in 2017. It was developed by JDS Development and Largo and is designed by SHoP Architects. One of the best amenities this building has to offer is the 75-foot Lap Pool located in the skybridge on the 28th floor. The bridge is glass enclosed and links the two buildings together, 300 feet above the ground. The pool was inspired by the idea of an urban beach. It provides surreal views of the iconic New York skyline on one side and views of the East River on the other. Other amenities include a high-end fitness center and spa, a climbing wall, a children’s playroom, a residents’ lounge, an open studio, and a juice bar. These are just some of the many incredible services this building has to offer. If looking for a place to unwind and de-stress, this 75-foot pool is the place for you. Engrossed in custom mosaic tile, this lap pool provides a relaxing atmosphere that residents can’t get enough of. Other amenities include a private Residents Club Lounge. This 12,000 square foot lounge offers a private dining space, a media screening room, a marble fireplace, and bar. There is also a state of the art fitness center that looks out over the garden. Parents always need a little time to themselves so the children’s playroom (creatively designed to look like central park) is a great place where kids can have fun while the adults can stop by the spa and enjoy the steam and sauna room. Not to mention, there is a golf simulator room for all of the gold enthusiasts who can practice their swing. Located at 225 East 19th Street, Gramercy Square is a post-war condominium building in downtown Manhattan’s Gramercy Park neighborhood. This building offers prewar living within a full-service condominium. This building includes a 75-foot sky lit pool accompanied by a hot tub looking out into the garden. 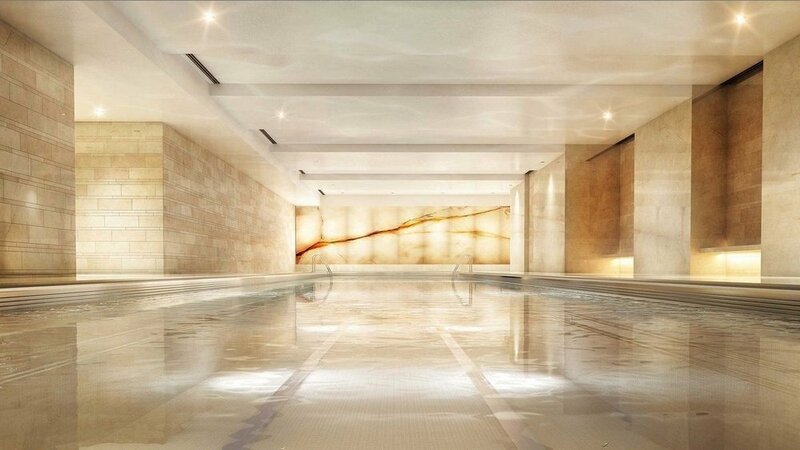 The pool is supported by marble imported pillars with a glass wall looking into the fitness center. Other amenities in this building include a sauna, steam rooms, a yoga studio, and a state-of-the-art fitness center. There is also a media room and golf simulator. For those wanting to unwind, there is a luxurious wine cellar and lounge with garden exposure that residents can enjoy after a long day. It is hard to find something this residence doesn’t offer.